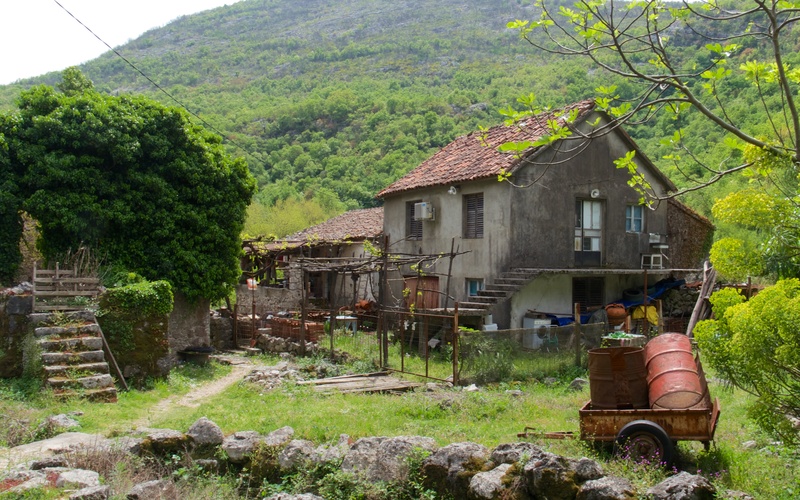 The road winds above Lake Skadar with panoramas of lake and forest around each hairpin; through the village of Kruševica where beekeepers tend the hives and signs hang above tables of laden with tall bottles; on through pretty Komarno, and, at the end of a steep slope with lake below, a new road descending the steep valley to the old village of Poseljani. I continue on until I find the yellow footpath sign near the Seljani stream marked for the same village. The path descends through dark hornbeam (Carpinus betulus) with a darker green understory of butcher’s broom (Ruscus aculeatus). A glade is welcome and in it a fabulous golden butterfly. 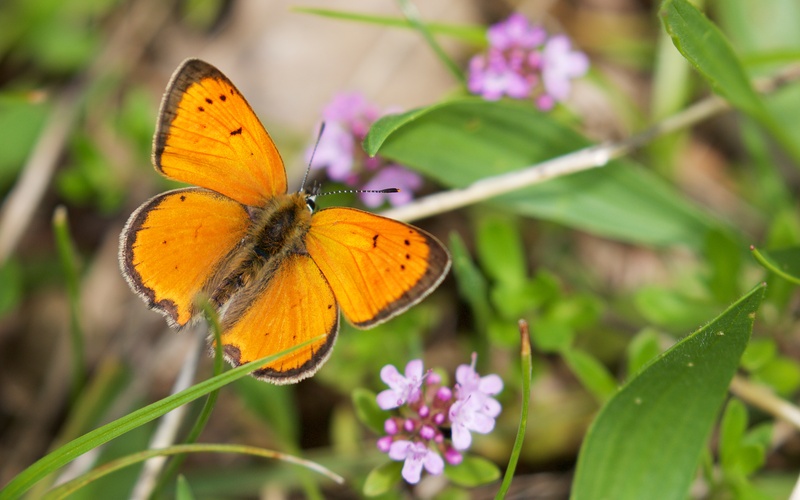 This is Grecian copper (Lycaena ottomana), a species local to the Balkans; two males would feed then fight in twisting circles before settling again on the thyme (Thymus drucei). They were both confiding and so was a southern festoon (Zerynthia polyxena) that looked drab by comparison as did a small heath (Coenonympha pamphilus); no other butterfly species can possibly compete. 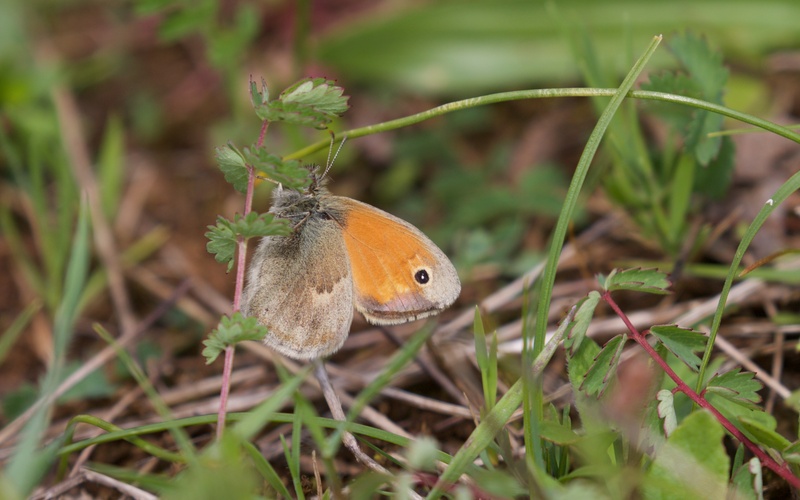 A radiant Grecian copper on thyme and small heath always with its wings folded. The path, after another stretch of woodland travelled by the side of the stream and a huge green toad (Pseudepidalea viridis) leapt in to the water with the loudest ‘plop’; it tried to hide under a stone but its large bottom stuck out and it forced its way further under with frantic digging and leg pushing, hoping in vain that its beautiful green-splodged camouflage would work for the exposed rump. When I walk back a few hours later it tries another rock but this one did not give any appreciable shelter at all. Green toad hiding in plain sight. A dipper flies by low over the water with whirring wings, dodging the branches over the water and away with a ‘zinc’. No grey wagtails today but a pair were up at the bridge a few days ago. 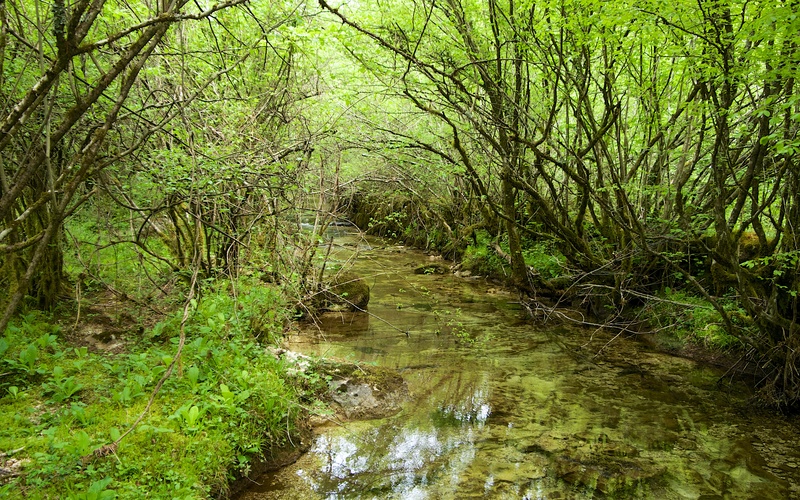 The stream has been managed in the past with retaining walls and the adjacent path laid with large stones; it is shaded by spring green leaves and dark-green moss-lined. The shaded path by the canalised stream. 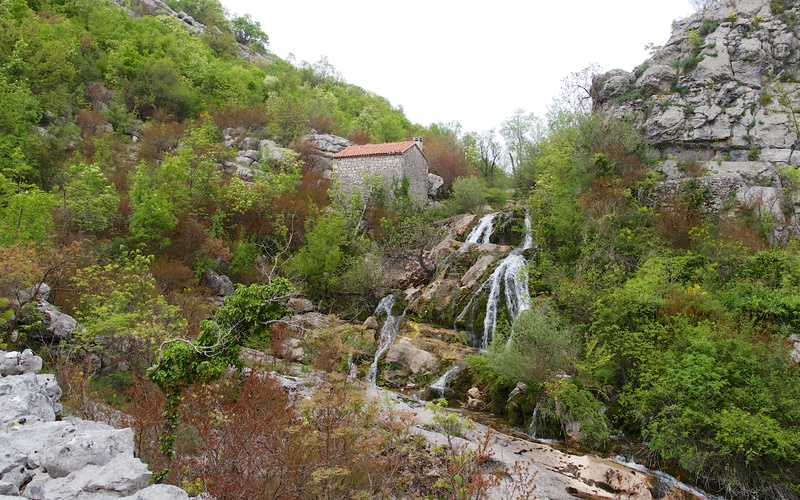 The path opens to a tumbling waterfall and the first of the mills that has been partially restored. The path descends steeply into a world of water and stone. 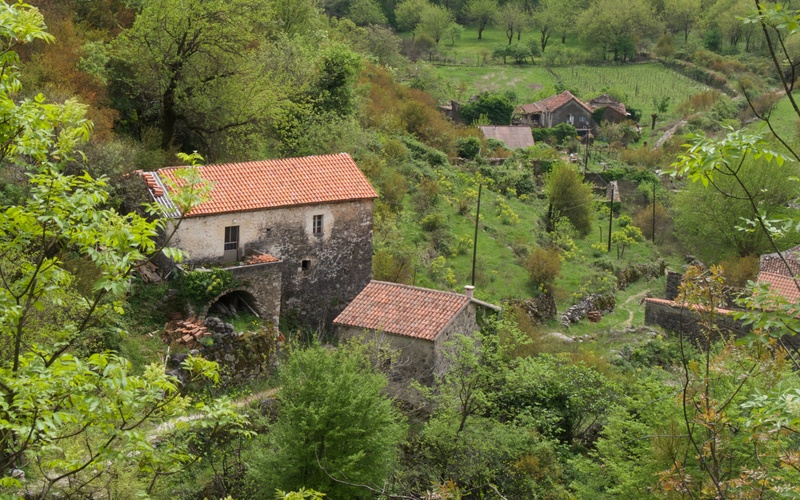 The mills that once ground wheat and the village that was a thriving community now reduced to one or two occupied houses and some new building or rebuilding by the lake’s edge. 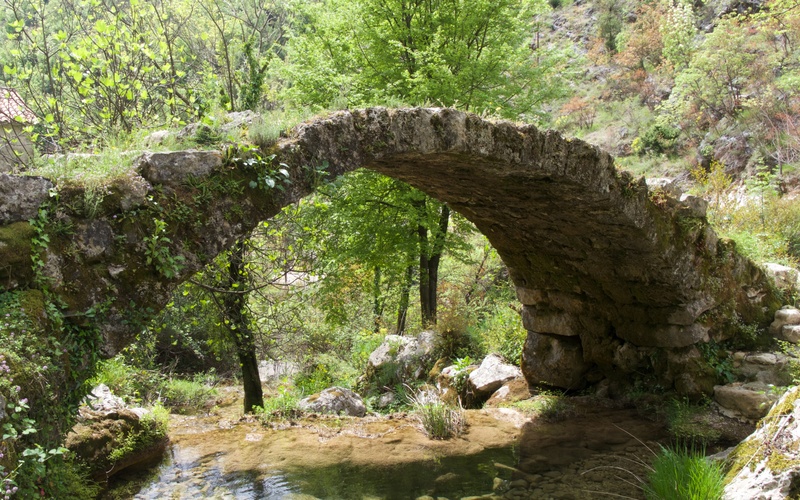 The little bridges are arched and impossible for anything other than walkers, straight out of ‘Alice in Wonderland’. A dipper flies off and I am sure has a nest in a recess under a mossy waterfall. 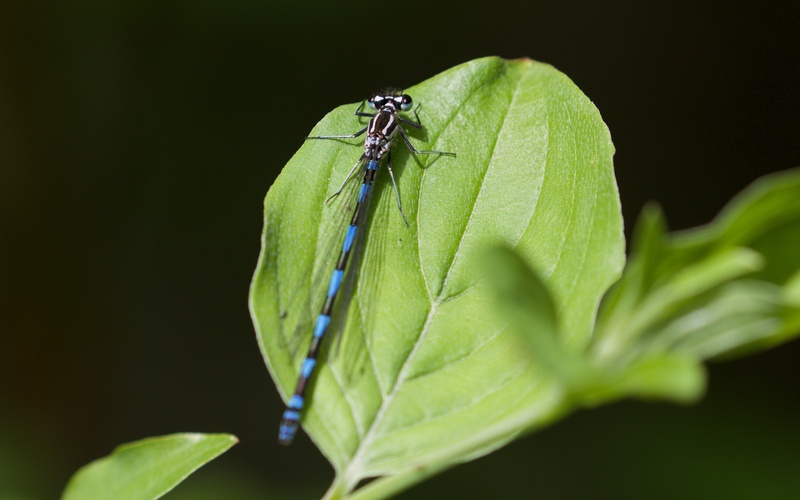 A beautiful blue and black-banded damselfly settles on a leaf; I think this maybe a dainty damselfly (Coenagrion scitulum). 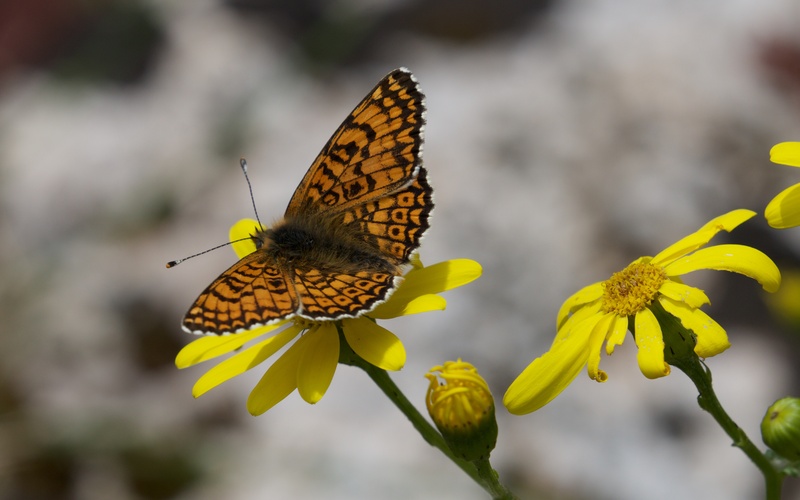 Glanville fritillary (Melitaea cinxia) is here too and a female Grecian copper. A courting pair of wood whites (Leptidea sinapis) are head to head, the male wagging his from side to side so his antennae caress the female’s antennae and wings; he also drops his wings flat in regular time; it is wonderful and intimate. 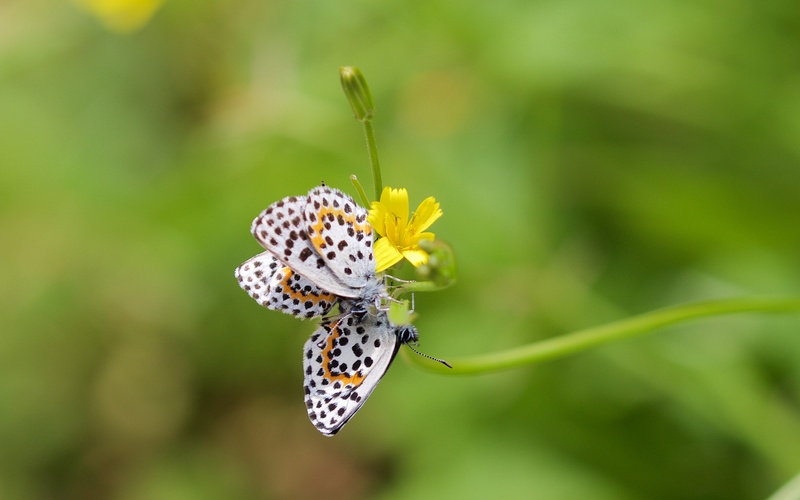 A mating pair of chequered blues are well past courtship and conjoined; they attracted another desperate male but he fails to prize the couple apart. 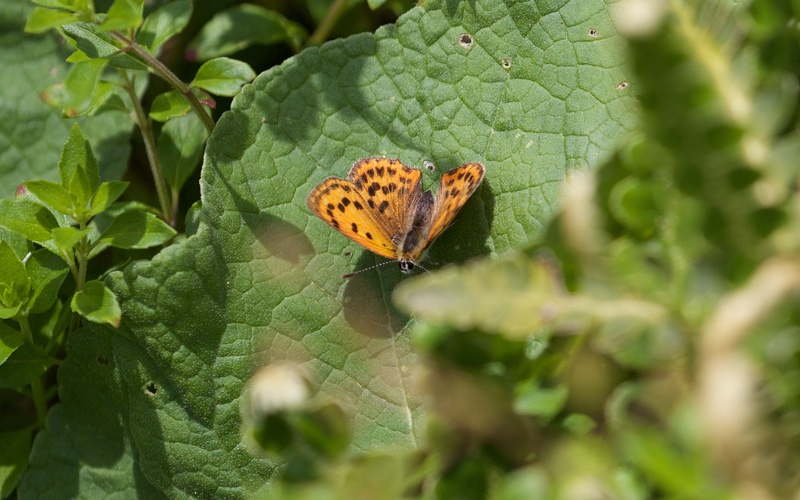 Glanville fritillary and female Grecian copper. 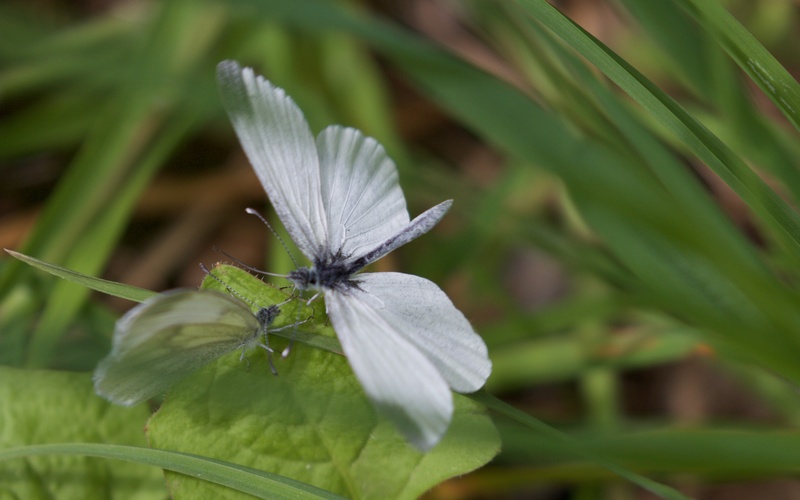 Courting wood whites and a pair of mating chequered blues with another male trying in vain to step in. Above the mills on the steep cliffs more beautiful, blue Scilla litardi, which is clearly widespread around the western end of Lake Skadar. Rock nuthatch is there too, noisy as ever, but I cannot locate it. I do the same with a blue rock thrush even higher up the cliff. 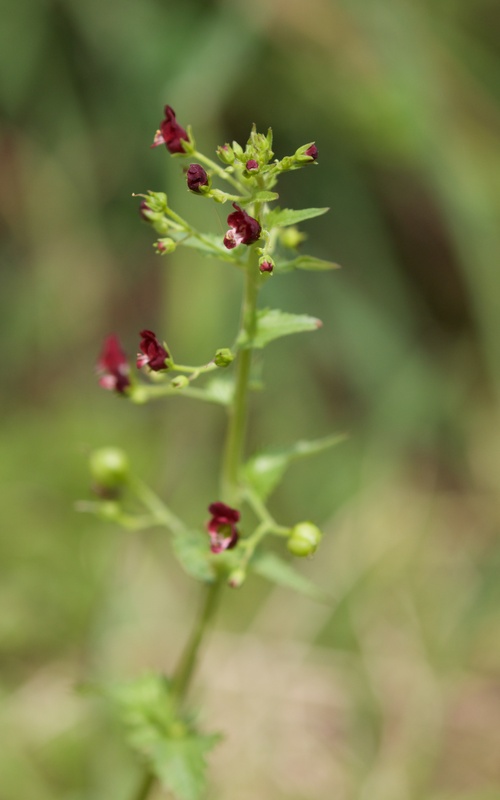 On the ground, water figwort (Scrophularia auriculata) with its diminutive but attractive red flowers. 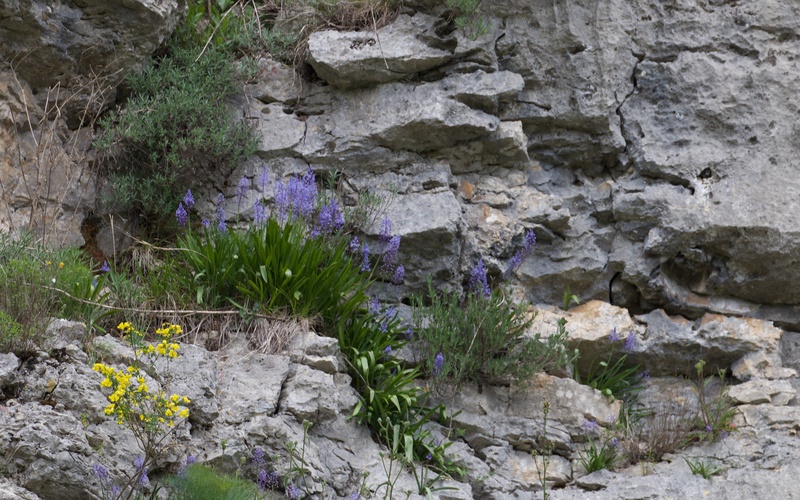 Scilla litardi and water figwort. A grass snake (Natrix natrix) is caught in the open on the path, turns and dashes back in to cover. Earlier on the road above the village, I chanced on a western whip snake (Hierophis viridiflavus), looking deadly in black but actually quite harmless. 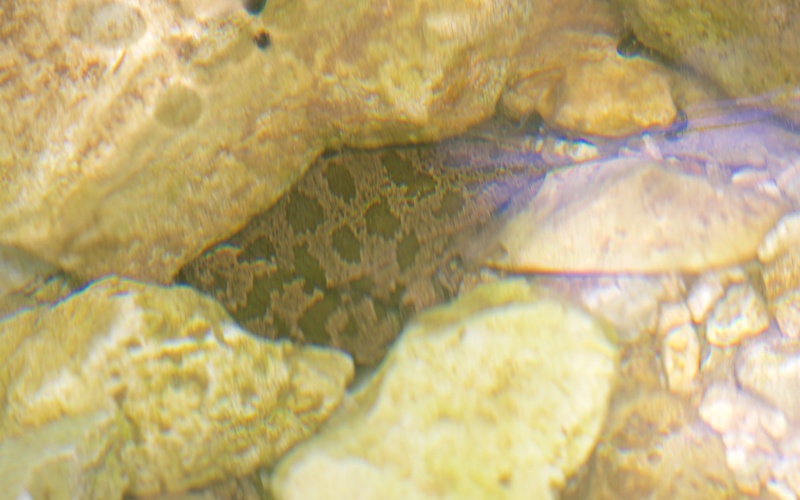 It curled up and hid its head when I lifted the stone under which it tried, in vain like the frog, to hide. 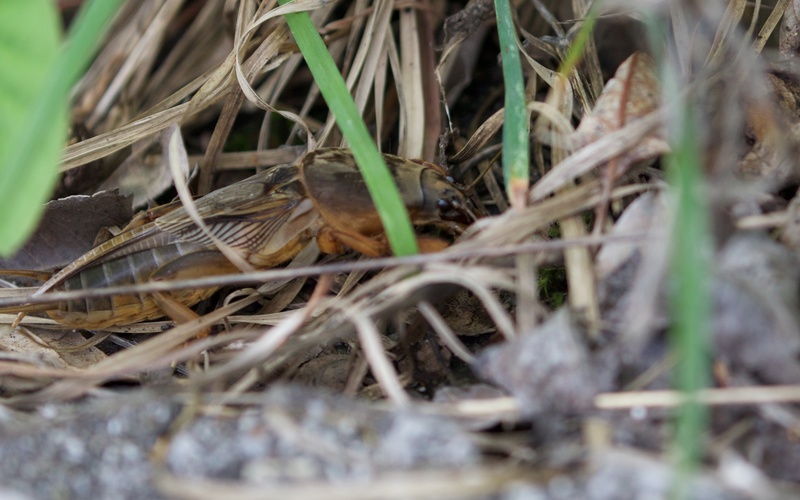 Close by, a huge mole cricket (Gryllotalpa sp. 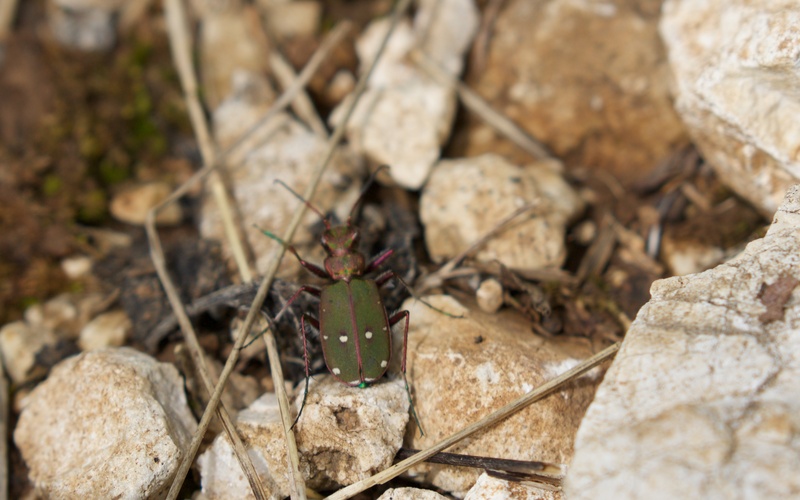 ), an armour-plated grasshopper dug into the roadside vegetation to hide. 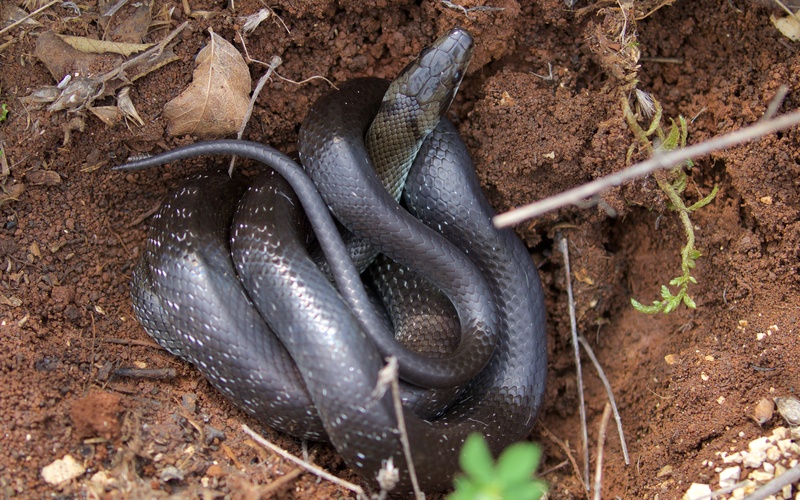 Western whip snake exposed from its hiding place under a stone and a mole cricket also caught out in the open. Poseljani is both rich in human history and wildlife habitat; the former nearly dead but being revived and the latter alive and golden. Finally, there are species here that I cannot identify; I don’t think they are rare just difficult but worthy of inclusion all the same. A green ground beetle and small wasp on Myosotis that remain to be identifed. Steve, this is another excellent example of your poetic commentaries, filled with snippets of human and physical geography, the trail itself, and your elusive or accommodating subjects. It’s such a joy to hear you having fun. I hope you don’t mind that I have shared (and am about to share) your blog with two of my closest friends. Deborah is already hooked, and I suspect Liz will be equally enchanted! Great work, keep it flowing.